At Math Corporation, we partner with clients to provide quality loan calculation solutions to meet specific needs. It’s no wonder we enjoy many Math Corporation testimonials. Discover more about us from our clients and the Math Corporation testimonials listed below. We are proud to share these Math Corporation testimonials as acknowledgements by clients of jobs well done. “. . . The task of developing a PC-based loan document system suitable for use with employee benefit plans undoubtedly presented a number of rather unique challenges, but they proved to be no match for your creativity and your comprehensive knowledge of banking mathematics and technology. We were very impressed with the priority your company places on customer service. 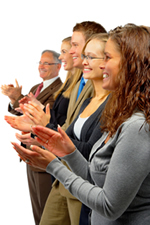 If you are a client and interested in sharing your Math Corporation testimonials, please contact us today!